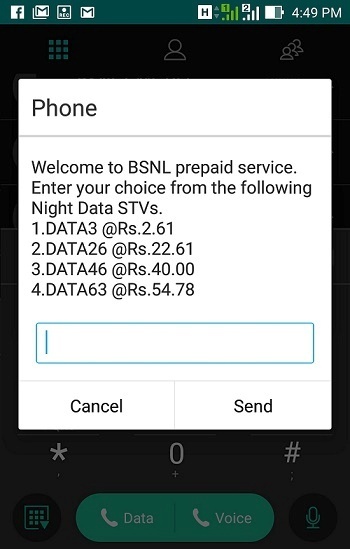 Bharat Sanchar Nigam Limited (BSNL) launched selfcare activation of Prepaid Night Data STVs through a new USSD short code *444# for its prepaid mobile customers. AS per the latest information, BSNL prepaid mobile customers having sufficient main account balance may activate Night Data STVs by dialing the USSD short code *444# from their number. 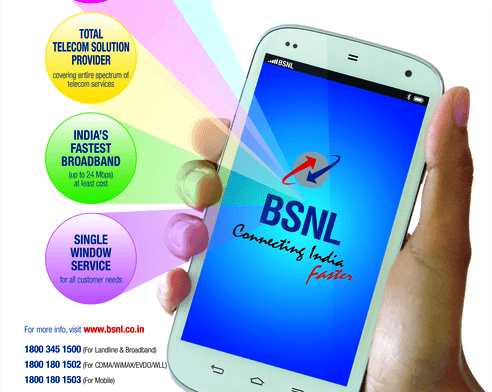 BSNL offers night data STVs starting from Rs 3/- (Night Data STV 3) on wards. Other prepaid night data packs are - Night Data STV 63, Night Data STV26 and Night Data STV 46. While activating STVs through Selfcare (USSD / Web Selfcare) or through SMS, the balance amount that would be debited from your main account will be always lesser than the MRP of voucher. It is because, service tax will not be deducted from your main account balance since it was already deducted while adding main account balance in your prepaid mobile. Hence, customers are advised to make use of existing full talk time / extra talk time offers and then activate BSNL STVs through SMS or Selfcare. In the case of Night Data packs, Rs 2.61 will be deducted for Night Data STV 3, Rs 22.61 for Night Data STV 26, Rs 40 for Night Data STV 46 and Rs 54.78 for Night Data STV 63. Dear readers, please share your views and opinions about this latest news via comments with us. how many of you are using BSNl's night data packs? Why BSNL is not giving the service tax discount for "Data STV 14, Data STV 57, Data STV 78, Data STV 98, Data STV 155, Data STV 156, Data STV 198, Data STV 241, Data STV 549 and Data STV 1099" when we activate the same through USSD code/sms? Will BSNL implement discount for the above mentioned STVs when we activate the same by USSD code or through SMS ?